Spring 2019 registration is now open! Visit the Lessons page to register! Brian Rivers provides the very best in guitar instruction. Brian loves working with all ages and abilities and has helped many guitar players, songwriters and musicians to become the performers they have always dreamed of becoming. 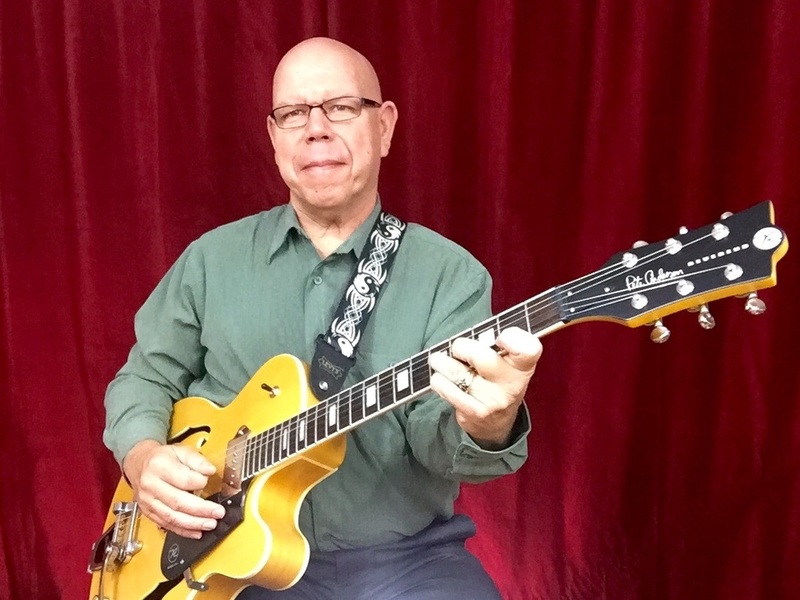 Brian is a music educator, award winning guitarist and graduate of the College-Conservatory of Music with a degree in Music Education with a specialization in Jazz Studies. Brian has extensive performance and recording credits and experience as both an acoustic and electric guitarist. Brian's home studio, Rivers Music LLC in the Clifton neighborhood of Cincinnati, OH. In addition to guitar lessons, Brian also teaches, bass, recording, songwriting, improvising, and music theory. Brian will help you to set goals and then give you the techniques and tools to achieve your goals. To see available lesson times, to register for lessons and for more information visit the Lessons page. You are only "one click" away from having your music sound the way you always dreamed it could be! If you want lessons fill out the form below, or call 513-335-0624 and get started now! Contact Brian about lessons now! The "Buy Now" button above is for lesson payments and other payments to Brian Rivers. ​Tristan loves to sing and always wanted to learn to play guitar. Tristan’s dilemma was, “Do I take private lessons, or do I teach myself?” Initially, Tristan tried to learn online, but couldn’t progress and knew that it would be a good idea to take private lessons. However, the idea of going to a suburban music store chain or institutional lesson center wasn’t appealing. What Tristan really wanted was to be able to walk to a Gaslight Clifton home lesson studio and study with an experienced and well-respected instructor. What Tristan didn’t realize is that Rivers Music had relocated from Hyde Park to Gaslight Clifton! Then one day while reading the Clifton Chronicle, Tristan saw an ad for Rivers Music and decided to call. Tristan asked, “Can a beginner take lessons?” Brian explained that, yes, individualized lessons are available for students of all levels and ages! Tristan was concerned about finding a lesson time on the schedule because Brian often has a waiting list, but after visiting http://www.brianrivers.com/lessons.html to view the online calendar, Tristan saw it was possible to start today! And the moral of this story? Don’t procrastinate learning to play guitar any longer! Quality guitar instruction is right here in our beautiful neighborhood of Gaslight Clifton! Contact Brian at Rivers Music and solve your own guitarist dilemma!www.riversmusic.com or brian@brianrivers.com 513-335-0624. 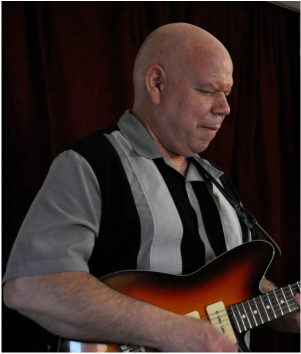 Brian is a musician's musician with over 30 years of professional experience and credits. He regularly performs with Cincinnati's very best musicians and songwriters at concerts and music festivals. In his regular role as sideman, Brian is known for his dazzling guitar playing and artistic sensitivity which combine to support and bring out the very best in an artist and song. Brian with Tracy Walker Playing some Slide Guitar. Brian is a proud to be a partner with Taylor Guitars. 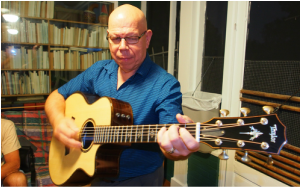 Brian plays a Taylor 916CE guitar because it is simply the very best acoustic/electric guitar available! When Brian visited the factory in El Cajon and learned about Taylor's commitment to quality and sustainability and Taylor learned about Brian's background and vision for the future of guitar education a partnership was born! Thanks to Taylor Guitars for their continued support and fantastic products! Brian is a DR Artist and uses and recommends DR strings to all of his students and guitar playing friends! Thank you to DR strings for their continued sponsorship and support. Rivers Music is now in Gaslight Clifton! Rivers Music is now located in the Clifton Neighborhood of Cincinnati. Method Book will be available Fall 2018! My guitar method book is done and is now with production staff, look for it in Fall 2018! Check back for more information soon!